Okay, so I had this awesome introduction written up but then Word locked and I had to start over. It’s pretty much par for the course since I don’t think any of the panelists have presentations (which in Fishkin’s case is a good thing — we don’t need 70 slides in 30 seconds, Rand). 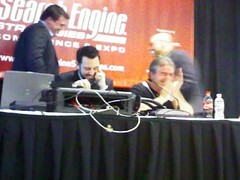 Can’t tell the players without a program: Brian Lewis, Engine Ready, is moderating this motley crew of speakers. 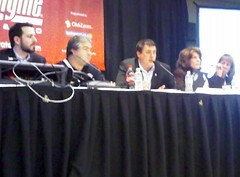 From left to right: Rand Fishkin, SEOmoz.org; Michael Gray, Atlas Web Service; David Naylor, Bronco; Christine Churchill, KeyRelevance; and Karen Weber, Irwin Union Bank. They’ve promised a fair fight tonight, this morning, whatever. Look, I haven’t had any coffee or breakfast yet. [Hehe! You’re funny when you’re grumpy, Susan. –Virginia] Anyway, the dudes are SEO, the chicks are PPC. Everyone gets a couple seconds to introduce themselves. Engine Ready did a test to see which converted better: PPC or SEO. They saw that PPC converted better and had a higher average order value (AOV). Putting it on a value per visit scale, PPC still won, and it also had longer time spent on site. (This is all traffic, not keyword to keyword, as Naylor points out. And the debate begins…) With that handy advantage given to PPC, Christine Churchill is going to go first. She takes a quick jab out first calling the guys “spammers” and promises to filibuster so that the SEO guys never have a chance to speak. PPC is an effective method for driving qualified traffic. Brian gives round one to PPC. I sense bias. Karen Weber is next, also for PPC. She’s going to give us her top five reasons why PPC rules. Manage to: ROI, CPA, etc. Rand Fishkin is up first for SEO. He brought a presentation. Bother. He asks who optimizes for Google [everyone] and why don’t all of you optimize for Bing? His point is that Bing is 10 percent of the market, like PPC is for clicks. And why would you go for the 10 percent when you could be going after the 90 percent? Yes, SEO is more challenging. Yes, it’s less controllable. 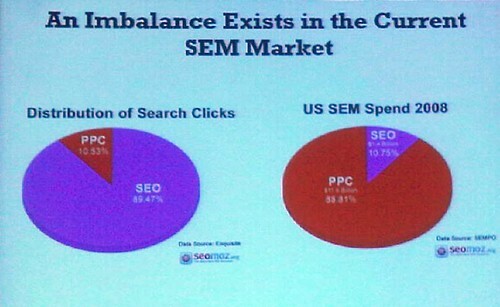 But people click organic results 10x more than they do on paid. …That was the whole presentation. Dave Naylor is going to make his case without a presentation. He says he’s going to switch sides to PPC. Hee. They launched a new site and it got written up in Gizmodo, Engadget, etc. They got 1.6 million unique views. 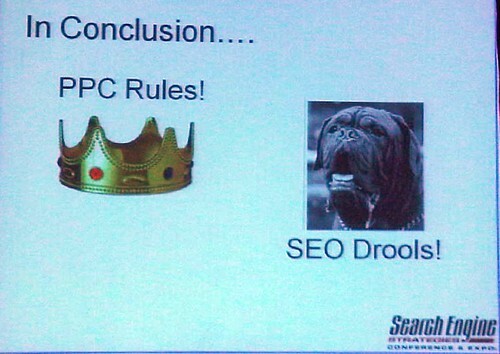 PPC is for testing. He calls the idea that you have to have one keyword per page for SEO “bunkem”. Hee. He says for seasonal, just think ahead. Start six months ahead. 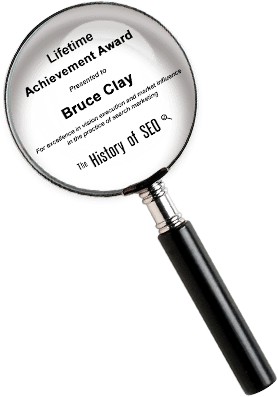 Michael Gray jumps up and says your SEO can help your PPC. Good domains get better pricing than bad domains. Yes, some things work better for PPC than for SEO, but whatever. 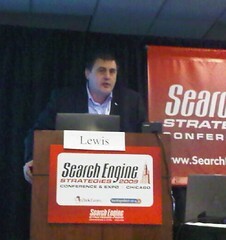 Brian Lewis talks a bit about how PPC is expanding beyond 70 characters. Now you can do videos and advertise your own products in the actual SERPS. Michael: AdBlock is one of the top ten extensions. Just saying. Dave: Those are taking up more real estate, yeah, but that’s ONE guy getting it. Rand: The number of clicks on PPC when down down down and now it’s slightly up again. Every time Google’s stock price take a hit, PPC clicks go up. Christine: Google’s been testing ways to get more clicks on PPC — ad site links, etc. Click rates on mobile are going up. Dave: It’s checkbook SEO. They’re buying to get rid of their competition. PPC is great for little businesses when they first get started but they can’t campaign against the big guys. Christine: She disagrees with Dave. Her small clients do very well by focusing on keyword selection and careful buys. Rand: SEO levels the playing field. [Drink!] With PPC you’re competing on price against people whose business model is more mature than yours. 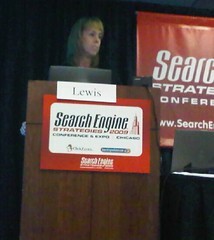 SEO rewards your performances and PPC rewards when you have a better business cost structure. 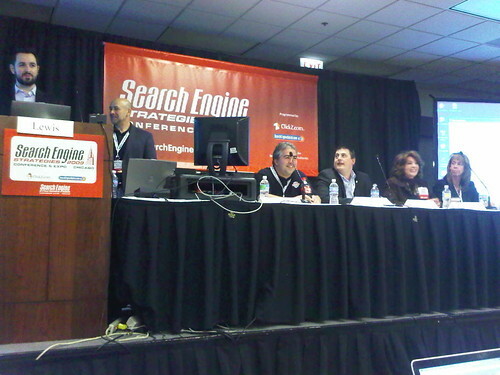 Christine: How long does it take you to get your SEO clients to implement your changes? Dave: They don’t change the PPC landing pages either. Rand: The great things is that if big companies aren’t implementing changes in PPC, you can win if you’re nimble and quick. You don’t have to pay a consultant, you can do it yourself. Dave: We try to do knowledge transference with our client. I want my clients to be self-sufficient so they don’t need me anymore. He wants challenges and he thinks that SEO or PPC should be taken in-house once they learn how. If you have to outsource one, which should you outsource PPC or SEO? Rand: If the debate was which do you invest in first, I’d invest first in conversion rate optimization. Which tactic helps social media most? Rand: It depends who you are. 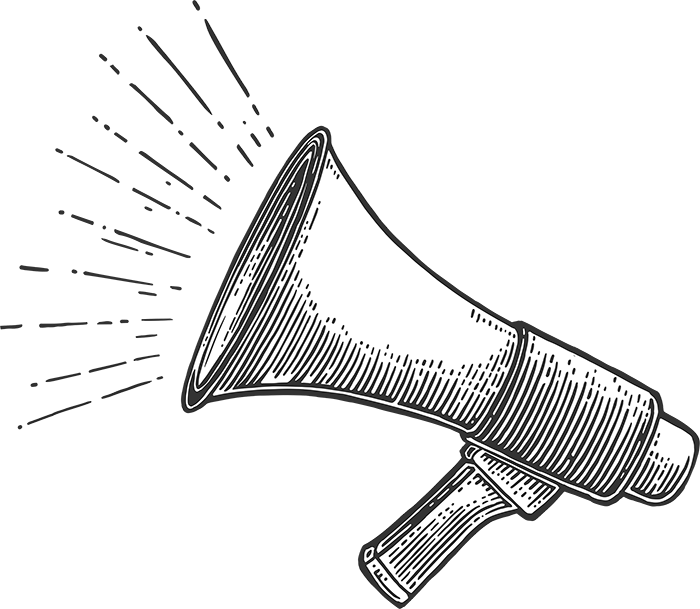 If you’re big and powerful and you haven’t done social media yet, the paid channels — Facebook, Stumbleupon, Reddit, Digg — could be very powerful if the demographics are highly aligned. It’s not nearly as well defined to do organic social media. Michael: It’s all case by case basis. Dave: …Is social media PPC or SEO? The panel says it’s both. Brian brings up the problem of last click counts. Their Engine Ready study was all last click information. Michael: If you show up earlier in their research phase now that Google is personalizing everything, that’s even more of an advantage. Dave: It’s all marketplace. If you know which car you’re going to buy, there’s no research there. 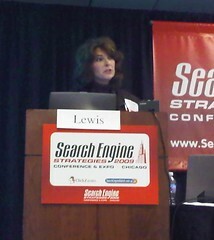 Christine calls personalization better for PPC than SEO. Rand says it’s good for everyone as long as you get in right at the beginning of the buying phase. No one seems to know if personalization occurs based on just organic data or both paid and organic. Lee Odden offers that Google Search Suggest comes from both paid and organic search, and it’s also based on number of results. 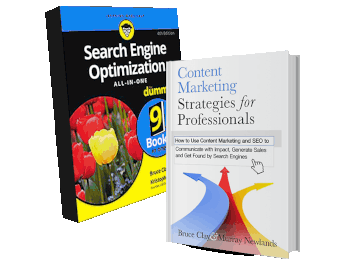 Everyone agrees that SEO has gotten harder and PPC has gotten more expensive. How do you pick an SEO company? Dave: Do you know anyone else who owns an online business? Do they have an SEO? Are they happy? Ask them. Rand: Search “recommended list” [which brings you to SEOmoz’s page]. Rand: Ask questions instead of asking for RFP. Ask for references. 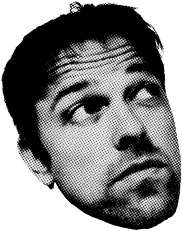 Dave: I’ve never been SEO organic clickfrauded. Hee. Does personalization benefit Google or the user? Four people in the room think it’s Google. Michael Gray raised both hands. Rand: Google culture is that they listen less to the scientists and more to the search team. Dave: That’s the problem right there. Dave: Does anyone think the real-time search is a huge reputation management problem? Someone volunteers that in Canada they’re definitely seeing PPC clicks affecting organic listings. I think that SEO is something better than PPC because if you got a good rank in search engines then your rank will be stable even after you did not work for some time.